American Hoppy Ales: Chloride and Sulfate and Ratios, Oh My! This is the second part in a series on American-style hoppy ales. The first part dealt with general water issues. American pale ales, IPAs and double IPAs (dIPAs) exhibit more hop bitterness, flavor and aroma than most other beer styles. And, the mineral content of your water can influence how that hop character is perceived. A second consideration, after water treatment to influence the mash pH, when brewing a hoppy beer is the effect of certain ions on beer flavor. In particular, chloride ions (Cl–) are said to enhance the malty aspect of beer as well as giving it a fuller mouthfeel, especially when levels exceed 200 ppm. In contrast, sulfate ions are said to have a drying effect, which accentuates the hop character of the beer. Sulfate levels of 200–400 ppm have been cited as appropriate for hoppy beers. Somewhat recently, however, many homebrewers have come to believe that the chloride to sulfate ratio is actually more important than the overall concentration of either of these ions. Others believe that this hasn’t been proven sufficiently. I’m in the “it looks promising, but more research is needed” camp, but I’ll go ahead and explain the idea here. Then, you can decide if it’s something you want to try. The basic idea is this, the smaller the chloride to sulfate ratio, the more it will accentuate your hop character. 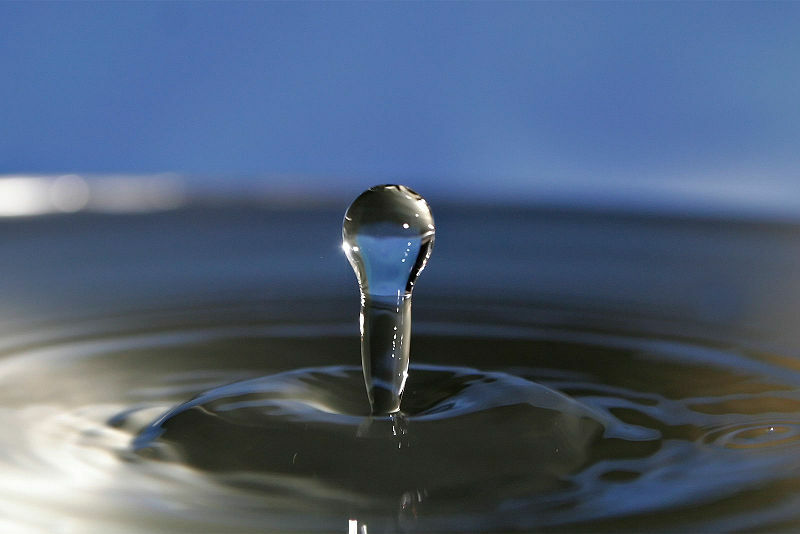 The levels of chloride and sulfate should be given in your municipal water report. They are usually reported in either parts per million (ppm) or milligrams per liter (mg/L). These measures are roughly equivalent for small amounts of small ions. When the ratio of chloride to sulfate in your water (compared as ppm Cl– to ppm SO42-or mg/L Cl– to mg/L SO42-) is approximately 1:1, your water will lend a balanced character to the beer. When the ratio drops to 1:1.5, the hop character will be slightly emphasized. Hop character will continue to be emphasized over malt as the ratio gets smaller. At a ratio of 1:5, the hop character will be accentuated to the point that most drinkers find it unpleasant. Incidentally, to take numbers from your water report and convert them into a ratio in the form of 1:X, divide both numbers by the smaller of the two numbers. For example, if you had 73 ppm Cl– and 167 ppm SO42-, divide both numbers by 73 to yield a ratio of 1:2.3. If your water has substantial amounts of either chloride or sulfate to begin with, your best bet is to use a water calculator to plan your salt additions. One easy way to approach this is to initially add all the calcium you need as calcium sulfate. Then, subtract a gram or two of this from the calculator and add the same amount of calcium chloride until you hit the ratio you are looking for. In the somewhat unlikely, but not impossible, situation where your water has more calcium than needed, but you still need to adjust your chloride to sulfate ratio, you’ll need to adjust the ratio first, then add some carbonates (via sodium bicabonate) to counteract the levels of calcium. What Ratio for APAs, IPAs and dIPAs? So what chloride to sulfate ratio should you use for hoppy beers? Your first instinct might be to use the maximally hoppy 1:5 ratio in your American pale ales, IPAs and DIPAs. However, you should consider if some balance would benefit your beers first, especially with pale ales and less aggressive IPAs. If you brew beers like this frequently, calculate the ratio you’ve used in the past and consider if adjusting the ratio might be beneficial. If this is your first time, a middle-of-the-road ratio of 1:2 or 1:3 — which favors the hops but doesn’t completely neglect the malt — won’t lead you astray. In the end, this is really a matter of taste. You will have to decide, by trial and error, what ratio you prefer — and indeed if you think the ratio matters at all. Water chemistry can be baffling to some. Tweaking your water chemistry may help your beers, but you don’t need to adjust ion levels to exacting levels to brew great beer. You actually have a fair amount of leeway with water chemistry when brewing any beer (so long as it tastes good and you’ve eliminated the chlorine). So, when brewing any hoppy pale ale, just remember that if your water doesn’t have a lot of chalk (calcium carbonate) or other minerals in it, just add a couple teaspoons of gypsum and a pinch of calcium chloride and you’ll probably be good. If your water is hard, you’ll have to work a bit harder to yield the best water. If you’re an extract brewer making a 5-gallon (19-L) batch, a 5-gallon (19-L) jug of distilled water with a couple teaspoons of gypsum in it should work great. Your malt extract will have some chloride in it already. Regular tap water will work for the remainder of the water you need. If you want delve deeper into water chemistry, start with a homebrew water calculator. Just plug in your local tap water numbers first, then see how various dilutions or salt additions change it’s composition. It may seem complex at first, but it gets easier with time. To help brewers who want to take the most straightforward route to adjusting their water, I present two quick water treatment guides in a separate post. In the next installment of this series, I’ll discuss the grain bill and mashing considerations for pale hoppy beers. I’m an extract brewer, and am planning an APA for my next brew (40 IBU, 1.055 OG). You answered my first question above about whether or not gypsum would still be helpful in an extract batch (I use store-bought RO water)… A couple of teaspoons would indeed help accentuate the hoppiness. My next question is when to add it. Does it have any reaction with the alpha acids themselves, or anything else chemically going on? Or is it just the presence of the sulfate ions alongside the hops that accentuate them? In other words, do we add the gypsum at the beginning of the boil (before or concurrent with the first hop addition), or at 15 min, or at flameout? Or does it really matter, as long as the ions get in there somehow? Thanks for the great info! When to add the gypsum is a good question. I’ve never seen an explanation of why sulfate ions enhance bitterness, so it’s hard to say. If the simple presence of sulfate ions in beer enhanced hoppiness, you could add them in your bottling bucket (to taste even). If, on the other hand, it had something to do with the chemistry of the boil and hop utilization, then you’d need to add it in the boil. Given that it’s not know (or at least I don’t know it), your only option is to either stir it into your brewing liquor (in your case, your RO water) or add it at the beginning of the boil. That would actually be a good bottling bucket experiment. Brew 5 gallons of IPA with a balanced chloride to sulfate ratio. Bottle one gallon, then add (something like) 25 ppm sulfate. Bottle another gallon and add 25 ppm more sulfate and so on. Maybe try for bottles with a 1:1, 1:2, 1:3, 1:4 and 1:5 chloride to sulfate ratio. with sulfate added at bottling. Hmmmm . . .
You can add the flavor ions directly to beer. (John Palmer’s recent book “Water” mentions this.) I did this last night – measured 25ml of water and added 0.5g of CaCl2 and 1g of CaSO4. When I take 1ml of solution and add to 500ml of beer, it’s the equivalent of about 50ppm sulphites and 25ppm chlorides (IIRC). When I read that, I had to check the top of the page for a 2006 date. I thought for sure it was very old. This has been pretty well beaten to death, and I wasn’t aware anyone, other than new brewers who have picked up on some buzz-words, believed this to be true. 300 ppm of both sulfate and chloride and worlds apart from 30 ppm of each. As is 300:100 compared to 30:10. The ratio was never meant to a simple, silver bullet solution. Only to roughly compare waters and help push the concept of sulfate and chloride flavor contributions. Somehow this term went viral and was taken completely out of context.